If you can't find IIS log files in C:\inetpub\logs you should open your IIS Manager and check if the logging option is present in the IIS menu section (top right in the screenshot). 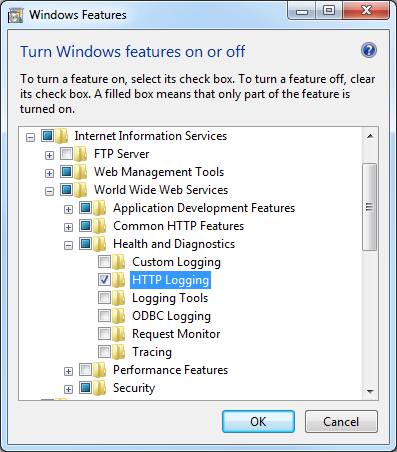 If you can't find the Logging option, go to: Control Panel\Programs -> Turn Windows Features on or off to enable IIS logging. I had to close the IIS Manager and open it again for the changes to take effect. Now the IIS should log to C:\inetpub\logs. After some intense Googling, I was able to find this article by Microsoft: Enable or Disable Logging (IIS 7). 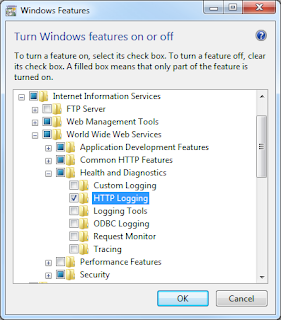 It states that logging is enabled by default in IIS 7. This does not seem to be the case on my IIS 7.5 (Windows 7 Enterprise). Exactly what I was looking for. Thank you!! Installed, still nog Logging icon, should I restart the f-ing server? I was also shocked to see its not enabled by default and the Microsoft tech articles don't even mention you have to add the feature from the windows program list! Laser printer: A great decision for a home office or little business, laser printers are a bit pricier and regularly greater, yet speedier and work out less expensive than an inkjet after some time. This is a source where you may gain lots of info about spy apps. Modern technologies make us think another way/ I'm sure that we use it too often. Even when we don't need to. I use this useful site for doing my homework. Talk on online banking trojans today!